I’m so excited to kick-off the 2013 Paranormal Week with one of my favorite people and one of my favorite all-time series: Premonition. When I read these books, I was completely floored. Obsessed. Enthralled. This is the kind of series that makes you ignore your family, read at stoplights and even dream about the story. And it wasn’t just me… all my friends and I were crazy over it! It’s all-consuming and a 6-star series for me. Absolutely action-packed, it delivers unexpected plot twists at what seems to be every turn. Just when you think the story needs to come down from such a high, Amy expertly takes us through yet another moment that would have my heart and pulse pumping at maximum velocity. AND… on top of the riveting action and the suspense, I feel the story has one of the most memorable romances… and for the record, I’m talking about Evie and Reed. Angels, vampires, love, mystery, action… these book have it all!!! One more book is left in the series — Iniquity — and will be out early 2014. This is the synopsis of book 1, Inescapable. My name is Evie Claremont and this was to be the making of me–my freshman year of college. I had been hoping that once I had arrived on Crestwood’s campus, the nightmare that I’ve been having would go away. It hasn’t. I may be an inexperienced seventeen-year-old, but I’m grounded…sane. Since meeting sophomore Reed Wellington, however, nothing makes any sense. Whenever he is near, I feel an attraction to him–a magnetic kind of force pulling me towards him. I know what you’re thinking…that sounds fairly awesome. Yeah, it would–if he liked me, but Reed acts as if I’m the worst thing that’s ever happened to Crestwood…or him. But, get this, for some reason every time I turn around he’s there, barging into my life. What is the secret he is keeping from me? I’m hoping that it is anything but what I expect: that he is not exactly normal…and neither am I. So maybe Crestwood won’t be the making of me, but it could be the breaking of me. I have been left to wonder if the dark future my dream is foretelling is…inescapable. I love them for the action and the high it gave me and for the unforgettable, passionate romance between Evie and Reed. When I think of their romance, I love to listen to I Won’t Give Up by Jason Mraz. Once you read these books, you’ll realize why the lyrics are so perfect. I agree that the popularity of the contemporary romance genre has eclipsed that of paranormal romance recently. One reason for this may be because, over the past several years, the market has become saturated by so many paranormal romance titles. But, I also believe that there will always be an audience for paranormal stories; there’s a great tradition for the genre. I write it because I’m completely in love with it; I find that it’s such an amazing escape for me from reality. I can slip into another world where the possibilities are only limited by my imagination. I’ve always been one to want to follow the white rabbit down the rabbit hole to see where the adventure will lead, but I’m also hoping to find some angst-ridden, hot, life-affirming love when I do. At its core, the Premonition Series can be defined in one word: becoming. In Inescapable, the first book of the series, Evie Claremont, the seventeen-year-old heroine, attends a prestigious college where she discovers that she’s not entirely human. As she begins to evolve the supernatural powers of a half-breed human/angel, she has to conceal her transformation into a supreme being from the humans surrounding her. Her troubles are compounded when she learns that her physiology is perceived as extremely dangerous to all the other supernatural species that she encounters along the way. Danger is not the only thing that attracts Reed Wellington, a divine Power angel, to Evie. He’s also drawn to her by the magnetic pull that they both feel while in proximity to one another. Not knowing whether Evie is of the Divine or the Fallen angels, Reed’s first instinct is to kill her, but Evie has awakened feelings in him he never thought to have. When Reed is with Evie, it’s as if his world has just begun, and he doesn’t want that to end—at any cost. As Evie begins to fall in love with Reed, she’s torn by her feelings for Russell Marx, the charismatic fellow student who’s constantly running to her rescue. Russell’s connection to Evie is instant for him; it’s as if he’s found the piece of himself that he always felt was missing. When Evie learns that Russell is her human soul mate, she tries to hide that fact from him in order to protect him from what she is becoming. But, becoming one of the most powerful beings in existence is as hard to hide as it is…inescapable. Speaking of Reed. And Brennus. And Xavier. And Russell. Tell us about your approach with love triangles… or is this a love pentagon? (A note of caution to the readers: This intense love situation has been quite divisive with my own group of friends… read at your own peril!!! #teamreed Also, check out my friend Gabi’s profile on each swoony guy: Reed Wellington, Brennus, Xavier, Zephyr, Russell). I don’t plot my books, I’m a panster, I write by the seat of my pants, so I’m often surprised at what happens in my books when I write them. That said, my approach to love triangles or love pentagons as the case may be, develops organically as the story evolves. For example, I didn’t have the idea for Russell in the story until I began writing chapter 3 of Inescapable. Freddie was intended to be Evie’s best friend and Reed her love interest. Period. But, as I wrote, Russell showed up and began talking to Evie on the walk to Arden Lake. At the time, I was thinking: Ummm…hello? Who is this? I wrote a little more, and it came to me whom Russell could be: Evie’s human soul mate—someone who has been her lover in every lifetime—the other half of her soul in a sense. I didn’t initially intend for Brennus to be a love interest for Evie. When I conceived of Brennus, he was this uber villain in my mind who wanted Evie for his pet—a plaything. As their relationship developed, she captivated him, making him crave her as his Gancanagh queen. I think the game changed entirely in Indebted when he saved her from the Ifrit Valentine. Then, when I began to develop the Gancanagh backstory, especially that of Brennus and Finn and how they became Gancanagh, it made readers sympathetic to them—to him. Brennus began to evolve into this powerful, seductive character; one who has the very real potential to eclipse Reed in Evie’s heart. What fascinates me about Brennus is his ability to be both unapologetically evil AND undeniably good. I find that the most compelling aspect of him and the most seductive. His potential to be redeemed by Evie and her potential to be damned by him is something that fuels them to fire. When I was writing Incendiary, Xavier, as a character, made sense to me. I had an idea to write a prequel to the Premonition Series, a couple of books of Evie’s life in high school prior to her arrival at Crestwood College. I thought that she would’ve had a guardian angel at that time, someone who would’ve protected her as she grew up. Xavier took shape in my mind, and when he did, he began to write himself into Incendiary. Timing is tricky; I think I accidentally stumbled upon a savvy way to publish when I released my first two novels in the Premonition series, Inescapable and Intuition. I published them within about three months of each other. With the release of Intuition, all of a sudden I had fans blowing up my social media sites; it was surreal. The third book in the series, Indebted, followed close behind Intuition at about a four month elapse between novels. 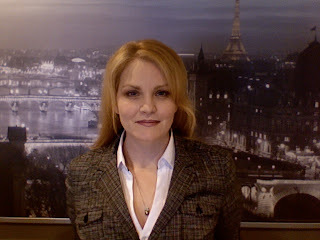 My readership surged, and I was among the bestselling authors in several genres on Amazon for most of 2012. As far as the release of Iniquity goes, I don’t have an answer for you because I haven’t released it yet. I think the length of a year between the release of Incendiary and Iniquity will hurt my sales. I had to weigh that with the fact that I really want it to be better than the previous novels. I’m willing to sacrifice sales for better content; it’s an integrity issue for me. I’d rather be late and amazing then quick and so-so. As far as my philosophy on re-reading the books before jumping into the fifth release, let me put it to you this way: I don’t spend a lot of time trying to catch you up on what happened in the first four books. As a reader myself, I hate when I have to slog through old plot points. I want to read new content and have thrilling new things happening to keep me engaged. This is another reason why this series is independently published. I don’t play by the rules. You probably can’t pick up one of these books not having read the first one and know what’s going on in the story. I’m okay with that. These are my first books. They’ve taught me a lot. I don’t feel like I have to compromise with the Premonition Series. It has been my escape, my classroom, my teacher, my highest high and my lowest low. I don’t think it’s possible for me to ever love any of my future characters the way I love these characters. What’s in your future after Premonition? I plan to release Iniquity in early 2014. I want it to be the final book in the series, but since these characters have been my life for almost six years now, it will be beyond difficult for me to say goodbye to them. So, I won’t know for sure if it is the final book until I write the ending. Like I said earlier, I’m a panster, which means I write by the seat of my pants and don’t plot out the story. A part of me really wants to make this the last book in the series if for no other reason than I don’t like the pressure associated with writing another one. I know I will want to write more when I get to the end of Iniquity, but I think I’ll write an ending, and then if I want to continue to write more later, I’ll write it in secret. If after all of that I think it’s good enough, I’ll publish it in stealth, and then announce its release after I publish it. Some of my favorite paranormal books are: The Twilight Series by Stephenie Meyer, The Outlander Series by Diana Gabaldon, The Odd Thomas Series by Dean Koontz, The Significance Series by Shelly Crane, The Caged Series by Amber Lynn Natusch, The Fire Spirits Series by Samantha Young, The Touched Series by Nancy Straight, and The Grey Wolves Series by Quinn Loftis to name just a few. Thank you Amy Bartol! I think I speak for all of your loyal fans when we say we can’t wait to see what’s coming and we’ll be ready to make a huge deal when Iniquity is out, no matter how long it takes! Love Amy’s books (!!) What an awesome giveaway! LOVE, LOVE, LOVE this series!! Thank you for the giveaway!!! I have Inescapable, but haven’t found the time to read it yet. I’ve heard great things about the Premonition series and I can’t wait to read it!! Thanks for the giveaway! Love to read and I’ve heard great things. Cant wait to read these!! Thanks for the giveaway!! I haven’t started the Premonition series yet. I have read so many good about this and I really love angels. I love Amy and I love this series. I got lucky and met Amy at the NYC book signing event, my very first one and she was wonderful to me. I am team Reed all the way and can’t wait for the next book and still hoping it isnt the last book. What a great giveaway, so many fantastic prizes. Vilma, reading your Premonition recap at the top of this post– total adrenaline rush. Not kidding. FANTASTIC interview! HOORAY for Paranormal Week! Looking forward to the rest of the week! thank you!!! You know, I need to add your link. it’s in the reading order, but not here. Going to do it now! You really made me want to read the Premonition series! Loved it! I fell in love with Inescapable and sadly have not been able to continue the series yet but they are high on my list!! I love Paranormal reads!! Thank you for this amazing giveaway!! This is my fav series I can’t get enough of evie and reed!!!!! I’ve read and reread the series again & again. I can not wait for the 5th book. It is just an amazing series. The characters just capture my attention and I care for them very much. Thank you for the giveaway & interview. It was a fantastic one. And thank you Amy for writing such a terrific series. I love the Premonition series! My sister told me to read them and I fell in love with the characters and with Amy’s writing. I absolutely love this series! It was one of my first paranormal reads and helped me fall hard for fallen angels TEAM Reed!!! I don’t think I can name one reason why I love this series I love everything about it Amy Bartol did an amazing job writing this series I was hooked in the first few pages and would freak out to win a signed copy Thank you for the amazing chance. Amy Bartol and Amber Natusch are two of my favorite authors. I can’t wait to read some of these other a others! Love Amy A Bartol and this series!! This was one of the first series I started when I got my first ereader and its one I suggest to everyone who asks for good books!! Love this series! I know Iniquity will be amazing! Can’t wait to begin reading this series…. it sounds wonderful!!! Thanks for the great giveaway…. such an awesome prize! Haven`t read it yet, but would love to! I adore this whole series. Phenomenal writer. Can’t wait to see how the story ends! I’m excited to read the Premonition series after hearing so many great things about it! Great post! I love the occasional paranormal series! I love Amy’s writing style and I can not wait to see what happens in Iniquity. As much as I hate waiting for the next book, I know it will be totally worth the wait. If you have not read this series yet you need to go buy it now!!!! Haven`t read it yet, but am looking forward to it! love this series! one of my first YAs! I have wanted to read these books for a long time. Thank u for the giveaway!! I love both Amy and Amberlynn’s books! The caged series is so well written, you can’t help but fall in love with the characters!! 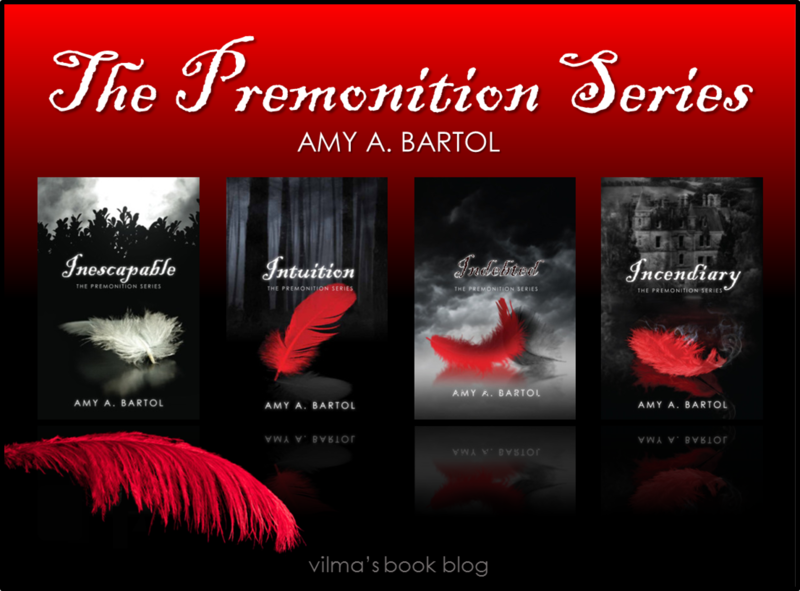 And Amy’s Premonition series keeps you guessing til the very end! Ir seems to be an interesting story, so I’ve decided to read it. i love Reed and Zee. Xavier should go live with the rats and i would not be sad if Tau went with him too! I came here from Gabi’s site and i am not disappoininted! I haven’t read this series. I didn’t even know about it until you featured it here. I love to read series. I like the way they continue a story you seem unable to get enough of. I love these covers. They are beautiful. When covers like these catch my attention I usually pick up the series in paperback…so I will be getting this series in paperback. Thanks for the intro to this series. Great interview and the series seems really good! Will have to check it out soon. 🙂 Thanks for sharing! I love the covers and they look really good ! What a great giveaway and a GREAT bunch of authors!